Schools tap application developers for mobile solutions. While still in their infancy, the apps promise to deliver students and school data on the go. Before the iPhone hit the mobile phone scene in 2007, the word "app" wasn't part of the typical person's vocabulary. That's changed over the last two years or so as an increasing number of software developers have come out with applications for mobile devices and an ever more diverse range of users, including K-12 technologists, educators, administrators, parents, and students. Following a path paved by Stanford University, which was among the first educational institutions to develop an iPhone app, K-12 schools are utilizing the mobile apps to get information out to students, parents, faculty, and employees via mobile devices. Latin School of Chicago and Sonoma Country Day School are among the K-12 institutions that are using the technology developed by Stanford University and adapted for use at their schools. 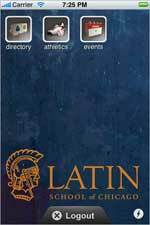 With a little more than 1,000 students, Latin School of Chicago launched its first version of the application at the beginning of the 2009-2010 school year. The school worked with Terriblyclever Design, which is run by a group of Stanford University students, and its own Web site designer to implement the iPhone app. Shandor Simon, Latin School of Chicago's director of networking services, said the seeds for the initiative were planted about two years ago at a local conference where school representatives discussed possible mobile initiatives. Still in its infancy at the time, the iPhone was considered a possible vehicle for delivering school information via a mobile network, but wasn't quite ready to handle the task. 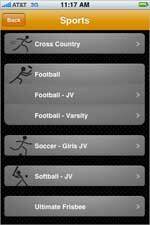 "It took about a year for the app to be developed," said Simon, who admitted that the first version of the technology tool is "pretty limited," yet still well received by the faculty members, students, and parents, who are using it to view online directories, calendars, sports schedules, and other important school-related information. "We put everything from our main school directory on the iPhone app and then put that information in the hands of parents, teachers, and students," said Simon. "There's so much buzz around the iPhone itself, and it's nice to have a vehicle for plugging into that and taking advantage of it." Simon admitted that the app has created a degree of "iPhone-envy" among constituents who own a different brand of cell phone. "The Blackberry users, while excited that our school is embracing new technology, wish that they were on the iPhone platform and able to use it," said Simon. On Simon's wish list right now is an application expansion that would allow the school to post academic information, homework assignments, and test schedules. "We're expecting that capability with the next release of the iPhone app," said Simon. "We like the idea of a student being able to use his or her iPhone to view homework assignments while they're at a game, or at football practice." In the future, Latin School of Chicago may also incorporate an attendance function into the iPhone app, thus allowing teachers to quickly take and report roll without having to sit down at a computer. "There are certain classes where it would make more sense to just give a teacher an iPhone or iTouch to handle the task," said Simon. "We don't have plans to do this today, but we're definitely headed in that direction." 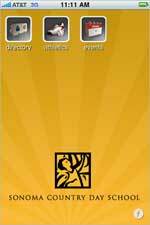 Sonoma Country Day School of Santa Rosa, CA, is also benefitting from its iPhone app implementation. With about 250 students, the school began using the app this summer after its Web site and IT provider inked a deal with the developers from Stanford University. Ed Fitzgerald, technology director, said the school was most attracted to the app's ability to store and display directory information. Currently, he said, the iPhone application includes all student, parent, and alumni data. The technology hasn't replaced the school's paper directory, but it has put the information in a more accessible place for authorized users. "Our board members have the school directory right in their pockets for easy access," said Fitzgerald, "while parents are using it to do things like contact other parents to schedule play dates and study sessions for their kids." Fitzgerald said the staff has also come to rely on the application, which dials parent telephone numbers directly from the listings page. So far, Fitzgerald said, there have been no challenges in either using or maintaining the app. "Once Apple approved it, we downloaded it, and the app was up and running," he said. Like Simon, Fitzgerald is also hoping that the app's capabilities will expand in the future. "We'd really like to be able to take attendance via iPhone," Fitzgerald said. "Right now, we're just waiting to see what's coming next in terms of new capabilities." To other K-12 schools looking to add apps to their technology lineup, Simon said the first step should be to take informal polls on who is using the platform itself (iPhone versus Blackberry, for example), and pick the one that makes the most sense for the potential users. "At first, we questioned the idea of targeting just one platform, but then we learned that we had a lot of iPhone users," said Simon. "We really haven't gotten much criticism for choosing this platform."